The tube of the month of October is again a rectifier. When you read my blog, you know that I'm very fond of TV damper tubes as rectfiers and use them in almost every project. I already presented the 6AX4 which suitable for almost all my needs. This article is about a TV damper which can handle more current: The 6CG3. The 6CG3 can handle a peak current of over 1A and a DC output current of 350mA. This means a pair of them in a full wave rectifier scheme with center tap can deliver up to 700mA of current when used with a choke input filter. The same for a full wave bridge with 4 of them. If you are conservative you can still easily draw half an ampere from a power supply with 6CG3s. I have used it in a power supply which had to deliver such a current. That is the same you can get from the big mercury vapour 866A. The 6CG3 has a 12 pin compactron base. Which is rather unusual in audio amplifiers. This base was developed by General Electric. The idea behind it was to be able to put all kinds of combinations of tube systems into one envelope. There are tubes with this base with 3 triodes in one bottle. This was an attempt to be able to produce for example TV sets with only one socket type. Therefore they also had to put TV dampers on this base. 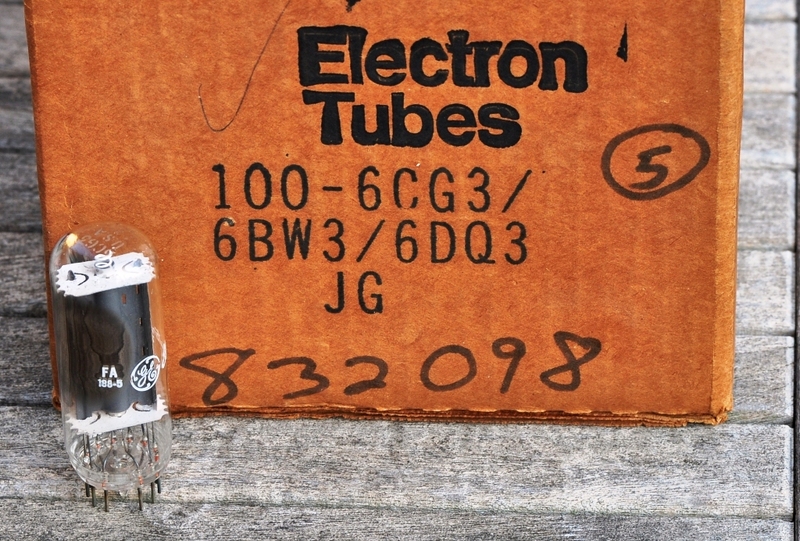 I like to use the 6CG3 in amps which use other compactron base tubes like the 6HS5 or 6HV5A. I also used it in my 211 amp with 6HS5 driver which I already presented in a series of articles. In those amps I use two of the 6CG3 in a voltage doubler arrangement. This rectifier scheme is very demanding on the diodes since rather high peak currents are drawn. The 6CG3 is just right for this and serves reliably in these amps. The peak inverse voltage is a remarkable 5kV! Although this should be derated for mains rectifier purposes, still it is more than sufficient for just about any audio amplifer. A minor drawback is the higher heater current demand of 1,8A. But still reasonable considering the current capability. Especially if you compare that with the 3A filament durrent of a 5U4. As all TV dampers the 6CG3 has a fairly low voltage drop even at high currents. Although it cannot compete with silicon diodes and not even with the mercury vapour types, it is still remarkable. But it has the benefit of beeing a very low noise rectifier which causes minimal disturbance during switching. The heavy indirectly heated cathode has a nice slow warm up which provides a delay and slow rise of the high voltage. A detailed datasheet of the 6CG3 is available here. You will notice that often the 6CG3 is labelled with several designations. The ones from General Electric on the photo above are labelled 6CG3/6DE3/6CD3. Many different TV dampers were brought out by the tube manufaturers. It seemed that every one wanted to have his own designation. Most of them were almost the same. 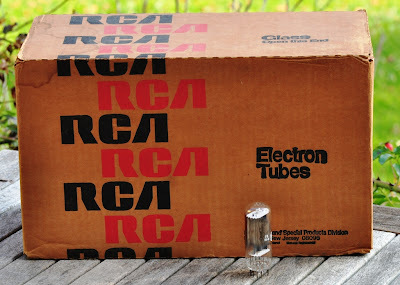 At the end of the tube era it was common to label tubes with several designations to cover different types with one article. The series of photos on the left shows some details of the construction of the 6CG3. The rather thick white spiral which extends out of the cathode sleeve at the top and bottom provides insulation between heater and cathode. This ensures the high heater to cathode voltage which the tube can withstand. The cathode can be up to 5kV peak above the heater potential. The DC voltage difference can still be 900VDC! This means that the heaters of power supplies for voltages up to that level can be referenced to ground. Even in a full wave bridge all 4 diodes can share the same heater winding which is connected to ground. For supplies which need to deliver higher voltages measures need to be taken to keep the potential difference between heater and cathode within the specified limits. Note that the allowed voltage is much smaller with the heater negative to ground. This voltage limit must be maintained otherwise there is the risk of a heater to cathode short. 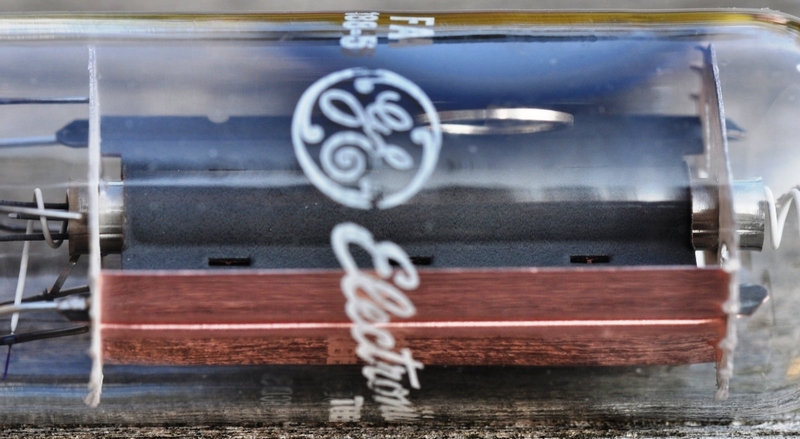 The third photo shows the base with the glass stem in the middle through which the envelope got evacuated during manufacture. Also note the nice copper plate structure on the photo below. So if you want to use a compactron tube, don't worry about the uncommon socket. It is available through several sources. Should you have trouble finding some, just ask me. The chinese made ceramic sockets are actually quite nice. Still I prefer the plastic ones. Not because I prefer old stock or dislike chinese sockets. I actually use chinese sockets quite a lot, most of them are ok. What I don't use is chinese tubes. But back to the sockets, what is the problem with the ceramic one? So far I used the 6CG3 in power supplies which deliver voltages in the range of 1200-1300V. 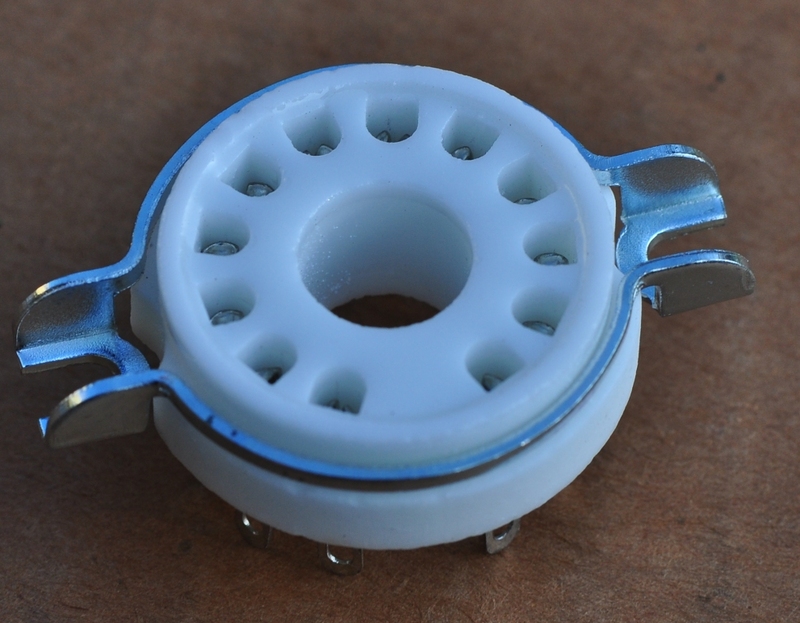 The ceramic sockets are intended to be mounted onto the chassis with the metal ring. This leaves quite short creepage and clearance distances between metal parts and socket pins which carry high voltage. The plastic socket provides larger distances: I also usually do not mount it directly to the metal chassis, but use some stand offs for recessed mounting. In addition I usually drill out the unused pins besides the high voltage carrying ones to enlarge distances. See the photos on the left for details how I did this on a plastic socket. Pins 3, 5, 9 and 11 are removed. The anode is brought out to pins 4 and 10, so it is just the pins beside the anode connections, which carries the AC input voltage in a full wave rectifier. Pin 7 is connected to the cathode which of cause also carries high voltage (rectified output). The two pins beside the cathode could also be removed. I left them in so that the socket still has a good grip on the tube. With too many removed, the tube would sit quite loose in the socket. This practice enables save operation of the tube even when used with high voltages. Remember high voltages do not need direct contact. Electrons become quite sneaky at voltages in excess of 1kV. They can jump distances through the air, so that a few mm of air is nothing but a short for them. This is probably a rather unusual choice of music but nonetheless an album I like: The soundtrack of the recent Disney movie Tron Legacy. 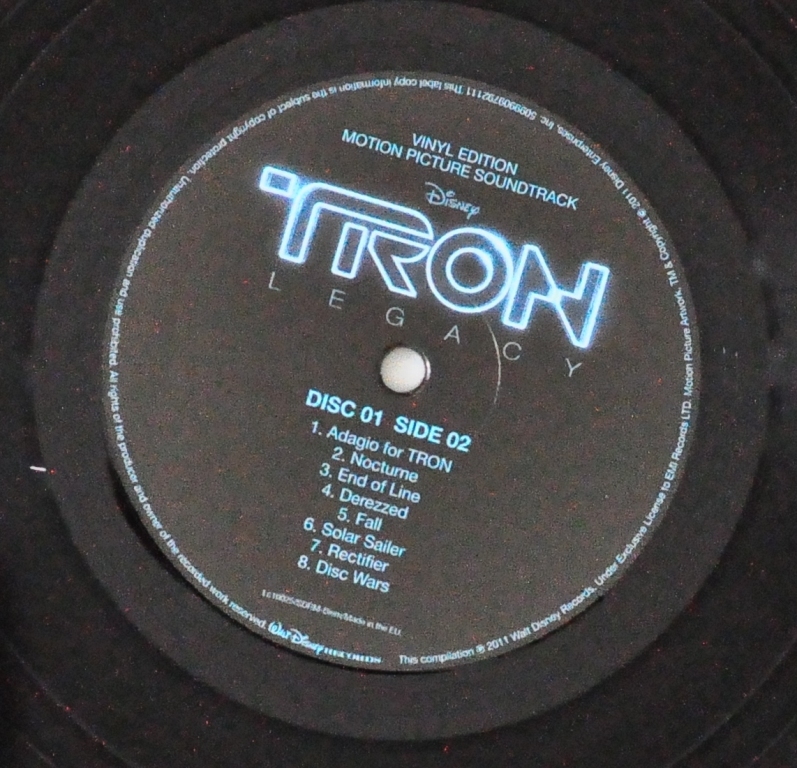 Being kind of a nerd I liked the original Tron movie which came out in the early 80ies. 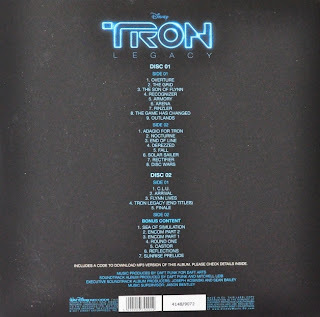 That one did not have a special sound track, at least I don't remember noticing the music during that movie. Very different with the sequel. While the story line of the movie itself has some weaknesses, I still like it a lot. They picked up the story quite well from where the first movie ended more than 25 years ago. The visual effects are spectacular. Some of the scenes seem very nicely thought through and choreographed. 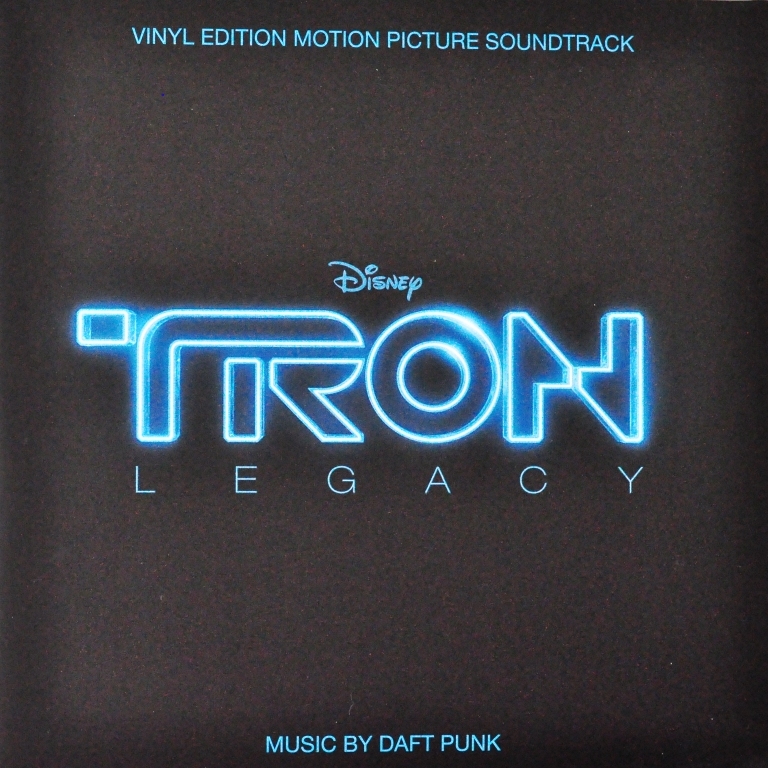 But what is best about this sequel is it's stunning sound track. 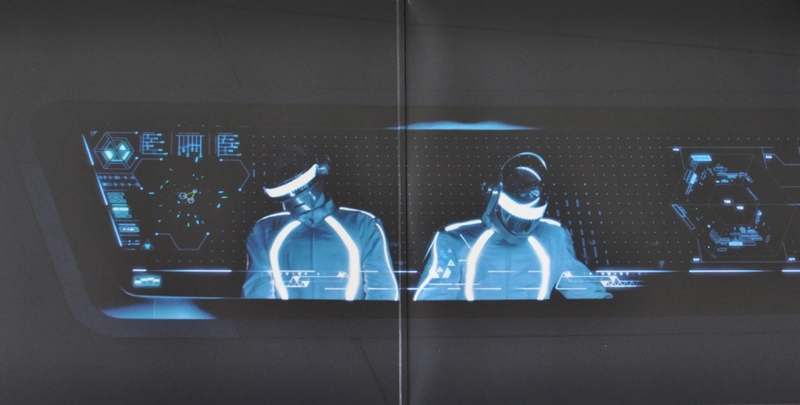 The music is composed and arranged by the french house duo Daft Punk. They came into the music scene 1993 and released two remarkable albums: Homework and Discovery, I like these two albums a lot and will prbably write about them in another post. 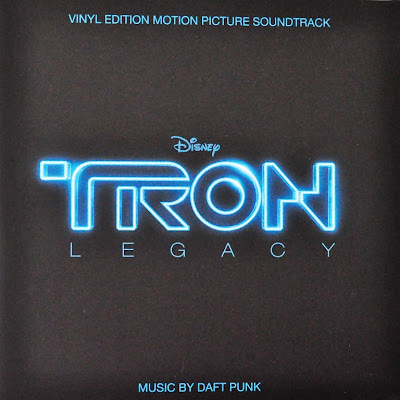 Daft Punk was an excellent choice by Disney. They wrote an amazing score without which the film would have ended up as rather mediocre. In fact the entire film is almost a long music video. In one of the scenes Daft Punk themselves have an appearance as the DJs in the 'End of Line Club'. My favorite track is 'Arena' which complements the scene to which it belongs extremely well. The main theme repeats itself with some variations throughout the soundtrack. Very cool also the title 'Derezzed' which is played at the end of the movie when the credits are shown. 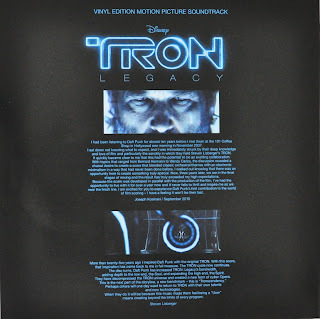 And the best of all: The sound track of a movie which is about digital worlds is available in analogue format on vinyl. Isn't that something! 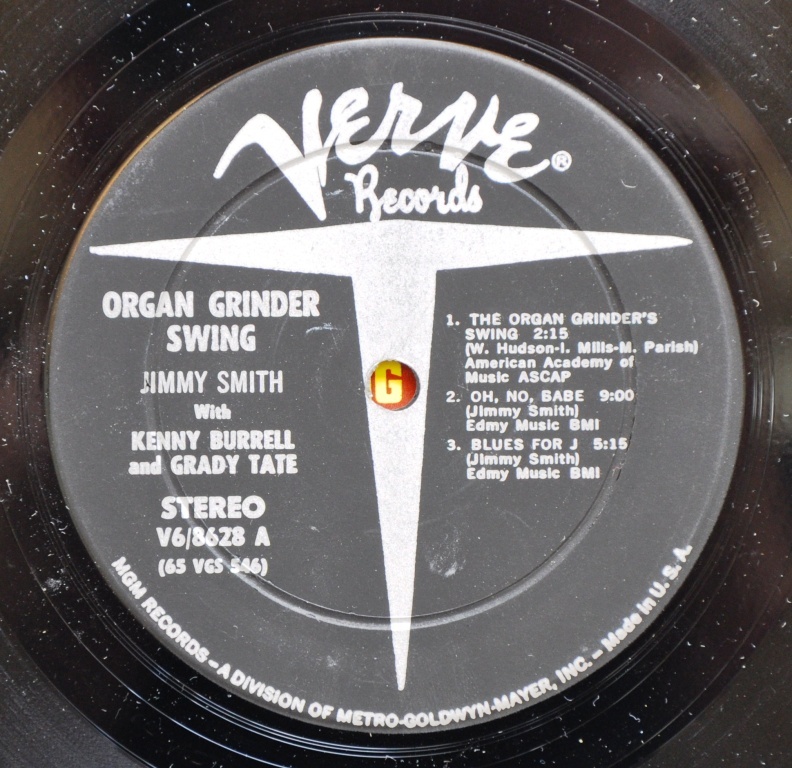 The name of the opening track, which gave the album it's title says it all: It opens right away with swinging and grinding organ sounds. Unbelievably groovy with that typical throbbing rythm. The album was recorded 1965 under the Verve label. The recording engineer was the famous Rudy van Gelder. He managed to capture those harmonically rich organ sounds perfectly. The sound balance is a bit on the dark side as is very typical for van Gelder. But the tonal balance fits nicely to the instruments. Also the sounds of Kenny Burell's guitar blend in beautifully. Throughout the whole album Jimmy Smith's passionate play keeps drawing you in. He was an amazing musician who's career lasted many decades. His nick name 'The Incredible' was well deserved. 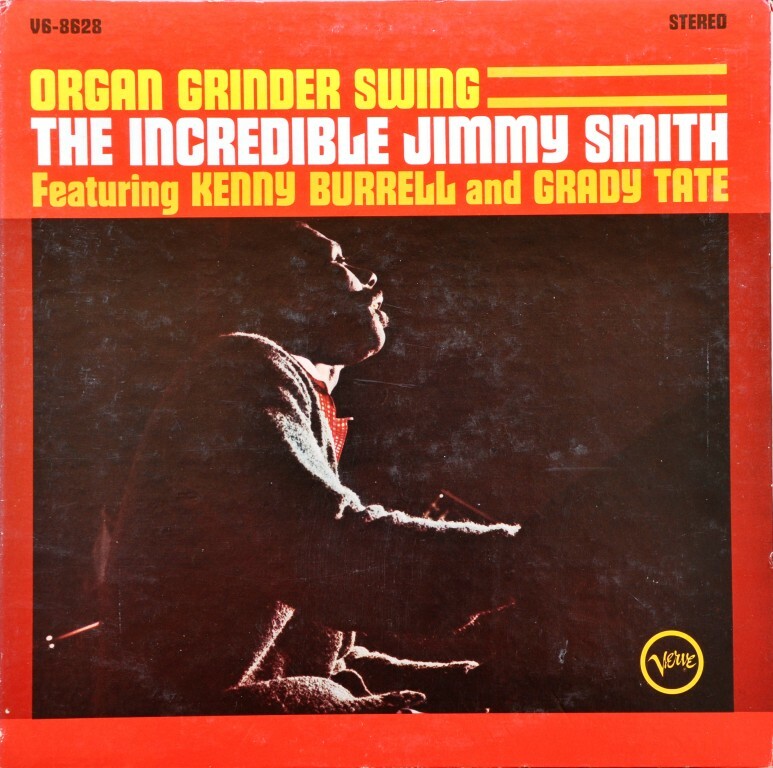 I had the luck to hear Jimmy Smith live before he passed away. At that time his health was already deteriorating. He was actually half paralyzed. Still he would give live concerts! He just used one hand to play. Even one handed he grooved away on that Hammond 300B! 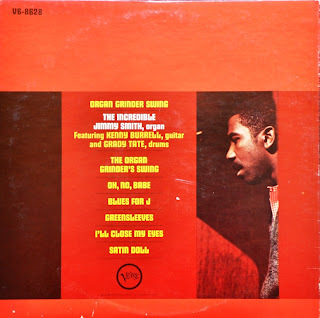 Jimmy Smith recorded a lot of albums some them are very different. He worked both with Verve and Blue Note. 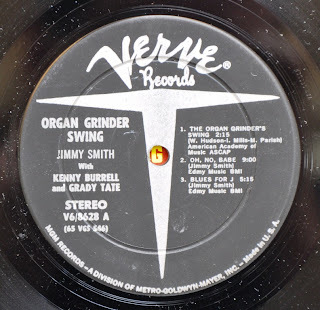 If you have none of his records yet, The organ grinder swing would my recommendation to start with. It is not very rare and can be found at second han record stores at acceptable prices. Go get it and savor it! How important are wire and cables really? Cables are a hot topic among audio geeks. Especially on discussion forums they cause heated debates which never seem to come to a conclusion. In this post I will try to shed some light on this topic from a different angle. If you do not have the skills and experience to build your own audio gear, all you can do in terms of cable is exchanging interconnects, speaker wires and power cords. In this case a valid question would be how much of an improvement can a high quality interconnect bring, when the wire inside the components are of a lesser quality. If you look inside a typical preamp for example you have considerable lengths which the signal needs to bridge: from input jacks to the input selector switch, from there to the gain stage, on to the volume pot, back to a gain stage and then to the output jack. Some preamps might have more or less gain stages, some use PCBs, others point to point wiring and many a mix of both. Very rarely you will see the same type of cable as is commonly used between components. So how much can a better quality interconnect really achieve in this scenario? 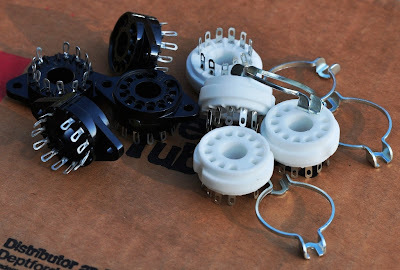 It is a bit different if you build your own gear and can choose the connection methods inside the components and use your wire of choice wherever possible. But still there are many pieces of the signal path left which you cannot change. 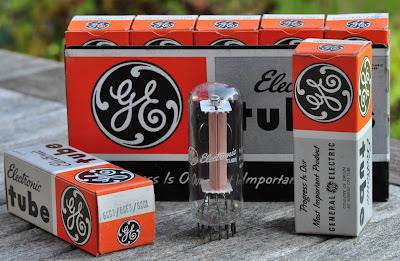 Let's have a look at our favorite amplification devices: The typical vacuum tube. In a triode, the signal has to travel through many connections and pieces of wire, many of different materials and very different connection methods, mechanical contacts, welded, crimped and soldered. The signal comes to the socket where it is soldered to a lug. If you are lucky, the solder lug and connection element to the tube pin are made of a single piece of metal. Sometimes, especially in sockets for larger tubes there are two. From the socket there is a mechanical contact to the tube pin. In Octal tubes, the pin is actually a shell which contains the wire which goes through the glass, it is soldered to the pin inside. Also the pins of directly heated triodes like 2A3 and 300B which have UX4 bases are made like this. The wire which traverses through the glass is not selected based on good sound, not even by good electrical properties. Here the thermal and mechanical behaviour is important so that no cracks in the glass appear when the tube heats up and cools down. Sound wise this type of wire is probably at the same level as barbed wire used in fences. Let's move on with the signal path. 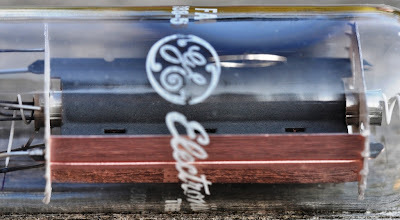 Inside the glass, there is another piece of interconnecting metal between this wire and the vertical rods which hold the electrodes like plate, grid and cathode. The actual electrodes then are clamped or welded to these rods. So on average there are about 5 pieces of different metal and 5 connection points through which the signal has to travel. And that for each electrode of the tube. Assuming triodes only this sums up to 15! And remember, probably none of the materials used are made of your favorite best sounding metal, also no audiophile solders used. 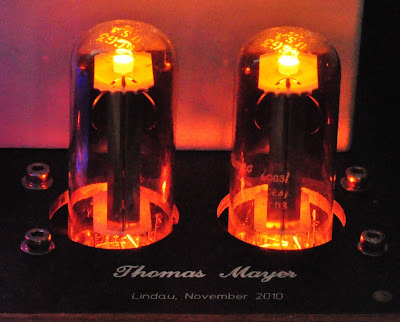 In an optimized vacuum tube based audio system and assuming analog playback you will have at least 5 tubes in the signal path between cartridge and loudspeaker. Probably more. That sums up to about 75 connections and pieces of metal through which the signal traverses. But this is not all yet. You have a similar picture in the passive components like capacitors, transformers, etc. rarely the actual wire used in the windings of the transformers is directly brought out to a solder terminal. Especially in potted transformers there is often some piece of litz wire used to connect the solder terminal to the actual windings. Again these are minimum 4 connections. In addition you have jacks, selector switches, volume control, etc. So conservatively counted this sums up to maybe 125 such connections per channel in your system. Most of them you cannot access and have no chance to use your favorite wire or connection method. This must cause sleepless nights to any cable fetishist. Considering this, how much influence can wire really have on the sound? Especially interconnects between components. Well designed components will have low output impedance so that cable parameters like inductance or capacitance will have no significant effect on the signal. Many of the connections inside components mentioned above are high impedance connections which are much more prone to be influenced by wire parameters, yet those are outside of our control! Consider this if you are worrying if your wire and conenctions are optimized. Even if you replace all internal wire of all your gear with the best you have access too and carefully control all solder joints and connections, you only optimize maybe 10-20% . Not really worthwhile to get paranoid about. Yes I also still optimize the wire, using teflon insulated solid core silver for internal hook up and for the inteconnects which I make myself. And yes, wire does make a difference in sound. But the difference is very small compared to the improvement which can be obtained by optimizing other aspects like circuit topologies, type of RIAA EQ, amplifier circuits, etc. Glossy HiFi magazines seem to have steered the attention of ther readers away from the really important aspects towards such much less important details. Often you will read endless descriptions about cables, their construction and how they influence the sound. Rarely circuit topologies, amplification devices, capacitors or transformers are discussed. With optimizing these things the real differences in sound can be obtained. I will not go into depth about power cords. Here the situation is even worse. Lengthy discussions about power cords and even silly things like fuses. Yet silence about power transformers, their core materials and if they have screens. Rectification devices? Rectification scheme? Filter topology? All these things have a huge influence on power supply performance and how sensitive a component reacts to disturbances from the mains. All these more important aspects should be thought through and optimized first. Then it is worthwhile to also focus on details like wire. What is the point of a 200 Euro power cord on an amp with a crappy power transformer, and cheap filter chain? The reason why a power cord makes a difference (if there really is one) is most likely because of the cheap and noisy power supply it feeds. I'd rather fix the power supply in this case. Similar story with interconnects. If you hear a big difference between two cables, it might not be an indication of the quality of the wire, but rather a hint that the component driving the cable has an inadequate output stage which is affected too much by cable parameters.